Beets and beet juice are both high on the list of nutrient-rich food products. The main difference is the fiber level: beets contain dietary fiber, but beet juice does not. As with most fruits and vegetables, the juicing process for beets retains the vitamins, minerals and other nutrients present in the whole food, but does not retain the fiber. The one exception to this is beet juice, which retains some of the pulp, allowing some of the dietary fiber to be retained. Beets are a virtual nutrition superfood. They are one of the best natural sources of nitrates and antioxidants, as well as being fiber-rich and high in essential vitamins and folate. 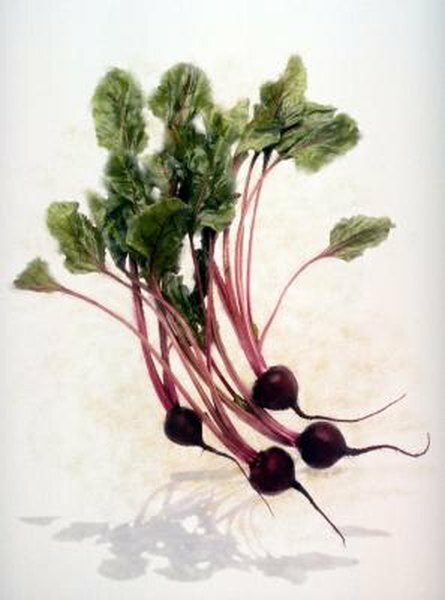 They have an earthy, slightly sweet taste due to the natural sugars beets contain. Both the beet root and beet greens can be eaten raw, cooked or in salads, and both provide numerous nutritional benefits. Beet juice is also an excellent source of many nutrients. It retains the vitamins, minerals and antioxidants of raw or cooked beets. Some of the minerals, including calcium and iron, are actually better absorbed when consumed in juice. Numerous studies have confirmed the detoxifying effect of beet juice, which can contribute to overall health and physical well-being. One of the few downsides to juicing ultra-healthful fruits and vegetables is that much of the dietary fiber in the whole foods is lost. Beets are no exception -- juiced and filtered beet juice contains virtually no fiber. While it is well worth consuming even without the original fiber included, you can make the beet juice a source of fiber as well. Keep some of the pulp remaining after the beets have been juiced and stir it back into the juice. You can also consume commercial fiber additive product an hour before or after the beet juice; do not mix it in with the beet juice because the added fiber could prevent full absorption of the juice's nutrients. Beet juice is extremely rich in cleansing properties, but also contains substantial amounts of natural sugar. This combination can cause dizziness or nausea if too much beet juice is consumed by itself. Beet juice should always be mixed with another mild fruit or green vegetable juice to avoid these potential side effects. Consuming beet juice can also cause urine and feces to turn dark red or almost black.